In the sport of mixed martial arts, every athlete dreams of becoming a world champion because it signifies that they have reached the pinnacle of success. Competitors invest blood, sweat, and tears to achieve the ultimate career-defining moment of having a gold-plated strap wrapped around their waists and hearing the announcer declare their names as champions. Like any other professional mixed martial artist, Japanese veteran Mei Yamaguchi has the same desire of becoming a world champion in the sport. Yamaguchi, who has been competing in mixed martial arts for a decade with 28 bouts under her belt, seems destined to be a world champion after dominating both local and regional combat scenes. The 35-year-old native of Tokyo, Japan carved her niche in the Japanese mixed martial arts circuit, winning three prominent tournaments. Yamaguchi further rose to prominence when she toppled three different opponents in Dream Jewels’ 2015 grand prix tourney to capture the company’s featherweight belt. Yamaguchi’s success in Japan led her to compete for the inaugural ONE Women’s Atomweight World Championship title in May 2016, facing Singaporean sensation Angela “Unstoppable” Lee in an epic showdown that would later win multiple “Fight of the Year” honors. However, Yamaguchi fell short in capturing the gold-plated strap as she yielded to Lee by way of unanimous decision. “If I had won, it would have been perfect. But still, even though I lost, a lot of people told me they cheered me and said, ‘Congratulations,’ so I did not feel bad. It was okay because I was able to make the audience excited,” she recalled. “That is the thing — I want to keep doing that as a professional athlete,” Yamaguchi quipped. Yamaguchi has been granted a second chance to vie for the ONE Women’s Atomweight World Championship belt as she will challenge Lee in the main event of ONE: UNSTOPPABLE DREAMS in Singapore on 18 May. The second encounter between Lee and Yamaguchi was supposed to happen at ONE: IMMORTAL PURSUIT last November, but the bout was cancelled after the Singaporean champion pulled out of the contest. Lee was involved in a car accident weeks prior to her title defense against Yamaguchi, and the injuries that she sustained in the unfortunate incident forced her to regretfully withdraw from the highly-anticipated championship rematch. Ever since Yamaguchi lost to Lee for the inaugural ONE Women’s Atomweight World Championship two years ago, she has polished her strengths and built her confidence up to new heights. 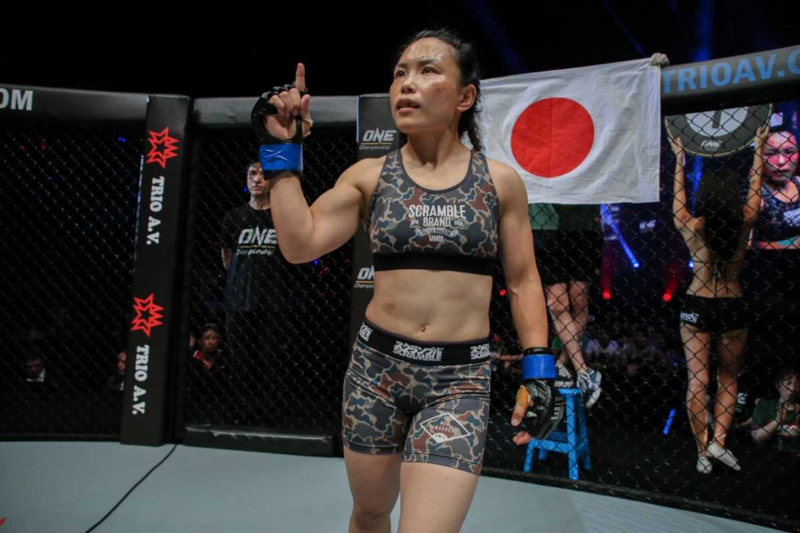 In 2017, Yamaguchi won her two assignments inside the ONE Championship cage on an impressive note. Yamaguchi submitted Jenny “Lady GoGo” Huang in June 2017, coercing her fellow former world title contender to tap via rear-naked choke in the first round. Yamaguchi cemented her position as the top contender for Lee’s atomweight crown by scoring a dominant victory over the Philippines’ Gina “Conviction” Iniong in a November 2017 rematch at ONE: IMMORTAL PURSUIT in Singapore. “My goal is to be a world champion. There were many challenges that came my way in 2017, but it did not deter me. I am destined to be in this position,” she said. Both Lee and Yamaguchi have grown tremendously since their epic clash two years ago as they have matured and expanded their skillset. Unlike the last time that both ladies stood opposite each other, Yamaguchi believes that she is entering the world title rematch with her morale at an all-time high. “The most important thing about being a martial artist is having good technique and good heart. Not everyone can get this chance to compete for a world title. I’ve got this chance, so that has given me confidence as a martial artist,” she stated. Yamaguchi revealed that she is planning to make the most of her second crack at the title as her new mission is to walk out of the Singapore Indoor Stadium with an intricately-crafted hardware around her waist and leave the decision out of the judges’ hands. “It is going to end early. It will be a clear finish by me. It is going to be a knockout,” she guaranteed.